LP is one of the most popular and favorite condominium building in Puerto Vallarta, with a total of 46 condo units. The condo building is a short two short blocks to the Blue chairs gay beach. 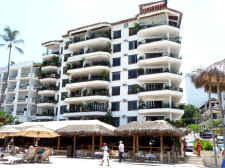 Amenities include elevator, telephone service in all units, reception desk, air conditioning in bedrooms only (with one exception, the LP-33 which has full a/c), ceiling fans, fully equipped kitchen, cable TV, 24 hour security and a large rooftop pool and sun deck terrace with great views of the entire Banderas Bay and Sierra Madre mountains. Maid service is six days a week, except Sundays and Mexican holidays. Two bedroom condos are for four (4) guests maximum; studio and one bedroom condominiums for two (2) guests. No pets allowed. Some of these luxury condos require a refundable security deposit. 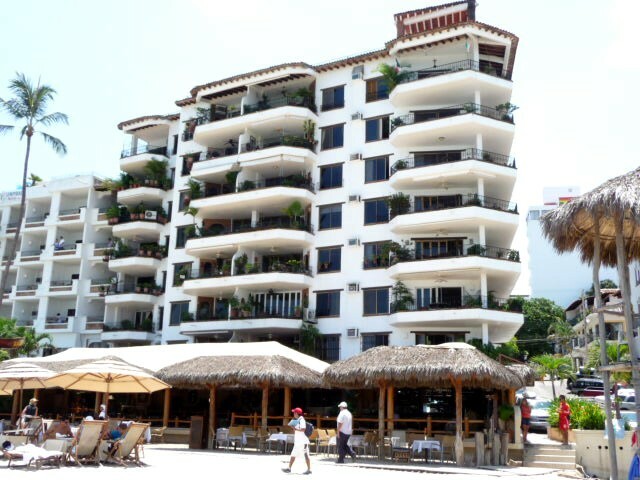 The beachfront condos are all two bedrooms. The studio condos are on the south side of the building and have good ocean/beach views to the south as well as mountain views, as is the same with the -06 two bedroom units which are likewise on the south side. 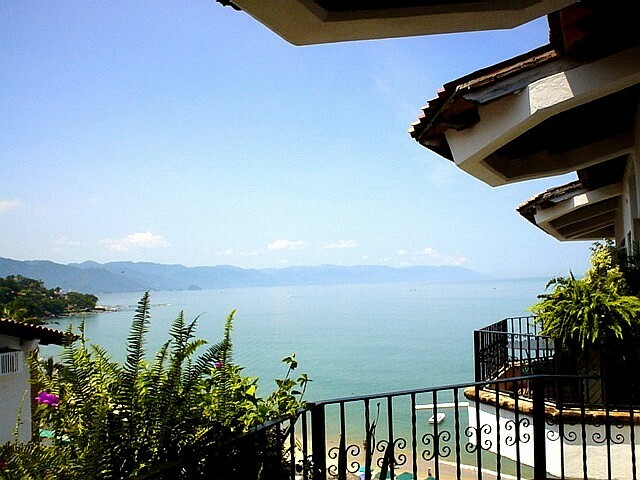 The one bedroom -07 condominiums are facing east, so there's no ocean view but pleasant city and mountain view. See more pictures below. 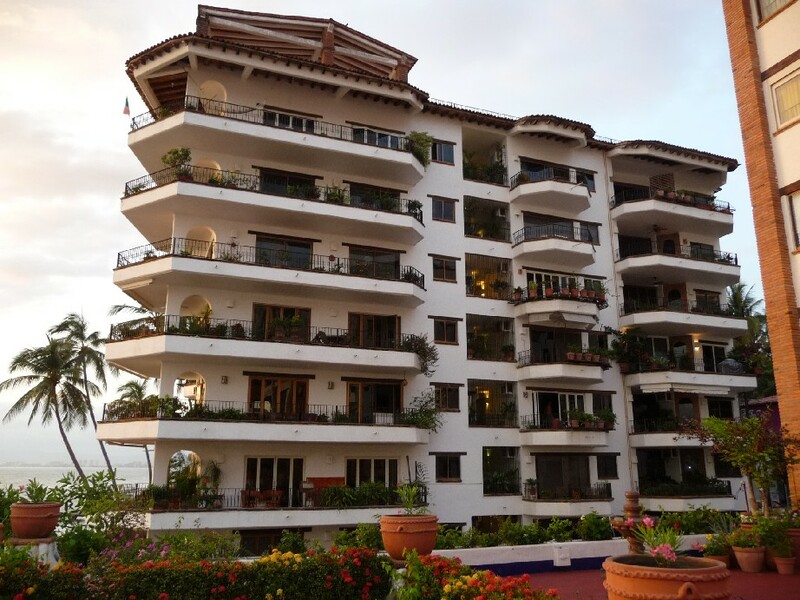 Condo building with staff of fifteen, a large common terrace sundeck area and rooftop pool with gorgeous panoramic views of Vallarta and Banderas Bay, 24 hour reception desk and security, elevator, and one of Puerto Vallarta's most popular beachfront restaurants, La Palapa. 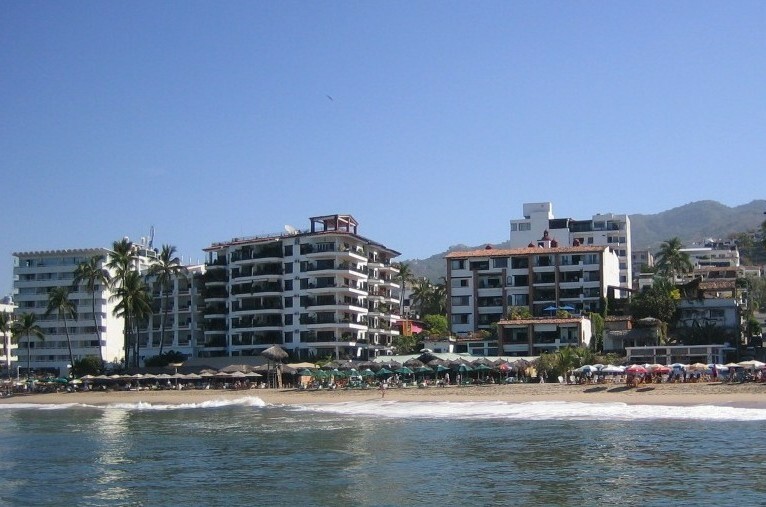 Centrally located so a very short stroll to all South Side shopping, dining and vibrant Puerto Vallarta gay nightlife of clubs, bars, lounges and Mexican cantinas; two blocks to the world-famous Blue and Green Chairs gay beach. Generally, seven (7) night minimum for any holiday rentals. Note: It's possible that there might be some noise due to renovations in some units in the LP building during the summer months from approximately May 15-Oct 15. 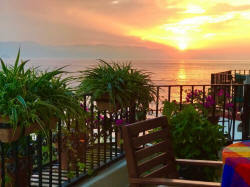 Condo rates: Vacation rental prices noted on the website or quoted to the client are in US dollars per night. Quoted rates usually include taxes and maid service. Maid service tips are not included, so please be generous to the maid and front desk staff as I am sure that you will receive good service. Clicking on the reference number of will take you to a page with more photos of that La Palapa condominium. There are at time photos of more condos upon request. Rates quoted are subject to change without notice and until the reservation is confirmed. LP-12 - First floor (second level above beach) ocean front unit. 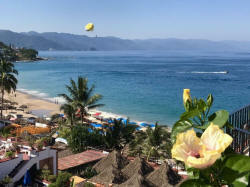 Two bedrooms each with a king bed, two baths with showers, fully equipped kitchen, cable television, CD and DVD player, a/c in bedrooms, wireless, living area opening onto terrace with only partial views of Los Muertos beach and Banderas Bay. LP-16 - First floor ocean-side. Two bedrooms, king bed and two twins, two baths, equipped kitchen, cable TV, CD player, air conditioning in bedrooms, smoking allowed; balcony area is barred in and there is only street view. 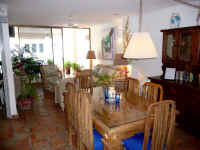 LP-21 - Second floor beachfront vacation rental. Two bedrooms, master with a king bed and the guest bedroom is king or can be split into two twins, two baths, equipped kitchen, cable TV, CD player, a/c in bedrooms only, ample living area and a balcony with lovely views of the Bay & beach. Nicely decorated. Nov 1-Apr 30, $232 per night. LP-22 - Second floor ocean front/center condo. 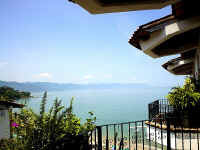 Two bedrooms, one with a king bed and the other with two twins, two baths, ample living and dining area, balcony with a good view of the Bay and los Muertos beach, fully equipped kitchen, VCR, stereo, cable TV. Winter: Nov 1-Apr 30, $207 per night; Summer: May 1 and Oct 31, $188 per night; Holiday weeks: $220 per night. LP-23 - Second floor ocean front condo. 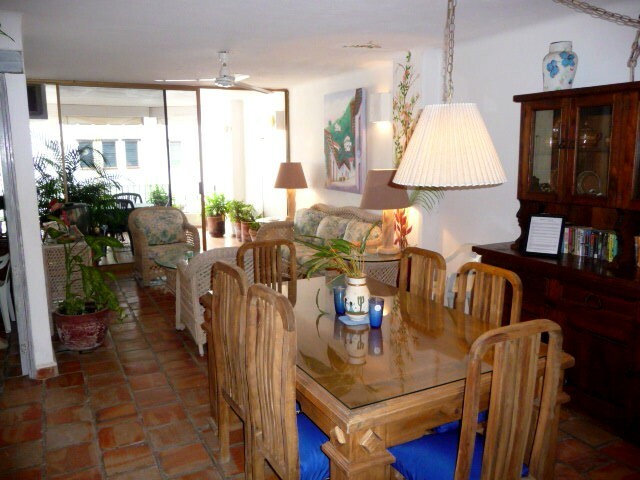 Two bedrooms, two baths, ample living area, balcony with good views of Banderas Bay, equipped kitchen, fans, flat screen cable TV and a/c in master and guest bedroom, as well as a mini-split unit in the living room, internet DSL modem, CD player, telephone for local calls. Nov 1-Apr 30, $284 per night; Oct: $160 per night; May, $188 per night; Summer: June 1-Sept 31, $157 per night; Holidays: please inquire. 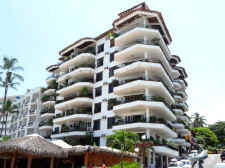 LP-24 - Second floor ocean front/corner condo. Two bedrooms, one with a king bed and the other with two twins/king, two baths, living and dining area opening onto wrap around terrace with lovely beach and bay view, fully equipped kitchen, cable television, stereo/CD player. Very nicely furnished. Winter I: Nov 1-Dec 24, $250 per night; Winter II: Dec 25-Mar 31, $295 per night. LP-25 - Second floor ocean-side studio. With a queen bed and a kitchen which is equipped with microwave, toaster, coffee maker and toaster oven, cable television, air conditioning, safe in unit, alarm clock, ceiling fans, living area opening onto balcony with a pleasant beach, partial Bay and mountain view looking to the south. Nicely appointed. Non-smoking. Approx 560 square feet. LP-32 - Third floor ocean front/center condo. Two bedrooms, both with king beds and private baths, fully equipped kitchen, satellite TV in the living room and both bedrooms, CD and DVD players, wireless internet, a/c in bedrooms, iron and ironing board, safe in unit, balcony with beautiful ocean and beach view. Recently remodeled and pretty nicely decorated with plenty of native and original art; one of the nicer condominiums on Los Muertos beach. Nov 1-Dec 19 and Jan 4-Apr 30, $255 per night except holidays; May 1-Oct 31, $188 per night; Christmas and New Years weeks with 7 night minimum, $288 per night. LP-33 - Third floor ocean front/center condo. Two bedrooms, both with king beds, two baths, fully equipped kitchen, cable television in the living room and master bedroom, stereo with CD player, full a/c, ceiling fans, balcony with beautiful ocean and beach view, very nicely decorated. A favorite for its warm ambiance. Winter: Nov 1-Dec 20 and Jan 4-Apr 30, $220 per night; Mid season: May and Oct, $150 per night; Summer: Jun 1-Sept 30, $115 per night. LP-35 - Third floor ocean-side studio. King bed, one bath, equipped kitchen, cable television, stereo, air conditioning, ceiling fans. Living area opening onto balcony with a lovely beach, Bay and mountain view looking to the south. Lovely and colorful decoration, recently totally remodeled. Nov-Apr, $165 per night; May and Oct, $120 per night; Jun-Sept, $90 per night. LP-36 - Third floor ocean-side condo. Two bedroom, with king bed in the master and king/two twins in the back bedroom, private baths, fully equipped kitchen, cable TV, DVD, telephone, stereo/CD player, a/c in bedrooms, living and dining area opening onto balcony with some nice city, mountain and partial bay view. 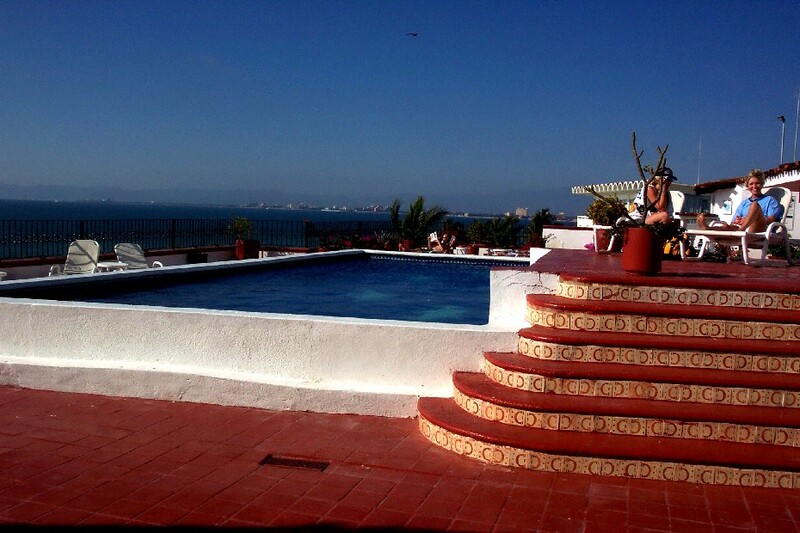 Nov, $150 per night; Dec-Mar, $200 per night; Holidays, $200 per night; Apr-May, $100 per night; Jun 1-Oct 31, $100 per night. LP-41 - Fourth floor ocean-front condo. 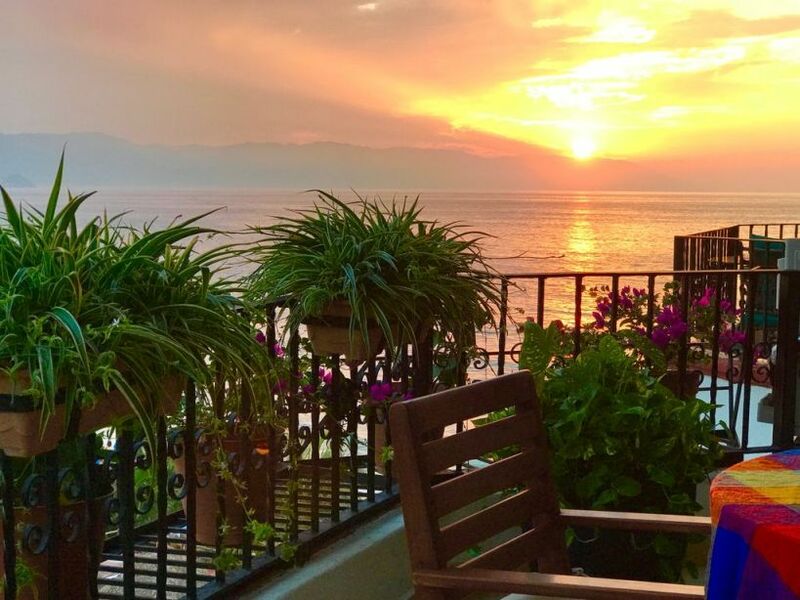 Two bedrooms, one with a king bed and the other with two twins/king, two baths, living and dining area with balcony with a wonderful view of the whole beach and bay, cable television, stereo, VCR. Rates: Winter: Nov 16-Apr 30, $205 per night; Mid season: May 1-31 and Oct 15-Nov 15, $155 per night; Summer: Jun 1-Oct 14, $125 per night. LP-55 - Fifth floor ocean-side studio. King bed, one bath, equipped kitchen, cable television, stereo/CD player boom box, air conditioning, ceiling fans, living area opening onto balcony with a great beach, bay and mountain view looking to the south, nicely decorated. LP-62 - Sixth floor ocean front/center condo. Recently remodeled two bedrooms with king bed in master and king/two twins in back bedroom, each with private bath, ample living and dining area, warmly decorated "comfy", balcony with a lovely view of the whole bay, flat screen cable television, stereo/CD player. LP-63 - Sixth floor beachfront/center unit. 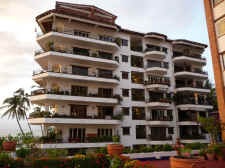 Remodeled two bedrooms with king bed in master and two twins/king in guest bedroom, each with private bath, ample dining and living, nicely decorated, flat screen cable TV, Bluetooth speaker, a/c in bedrooms only, balcony with beautiful views of Banderas Bay and its spectacular sunsets. A favorite for its fine decoration, warm ambiance and reasonable pricing. Approx. 900 square feet. LP-65 - Sixth floor ocean-side unit. Recently remodeled studio one with king bed, completely new furniture, sheets, bath and beach towels, a new all marble bathroom with shower, equipped kitchen with purified water system, quite nicely decorated, smart cable TV, ceiling fans, new mini-split a/c, living and dining area opening onto balcony with lovely mountain and bay view. Winter: $199 per night; Summer $100; Holidays $225 per night. LP-66 - Sixth floor ocean-side condo. Recently remodeled two bedroom unit with king beds, two baths, nicely equipped kitchen with granite countertops and purified water, cable TV in master bedroom and living room, mini-split air conditioning in living area and both bedrooms, ceiling fans, wireless internet, spacious balcony terrace with beach, mountain and South Shore views. Modern and stylishly appointed. LP-72 - Seventh floor beach front/center condo. Recently totally remodeled and refurnished, two bedrooms the master with a king bed and guest bedroom with queen, each with marble baths, equipped kitchen, fully air conditioned, CD player, living and dining area opening onto wrap around balcony with splendid Los Muertos and Banderas Bay views. Security deposit. Nov 1-Apr 30, $420 per night; May 1-Oct 31, $240 per night. LP-73 - Seventh floor ocean front/center condo. Two bedrooms with king beds, each with separate bath, recently re-decorated in modern style with rich colors and artwork, balcony with a lovely view of the whole bay, fully equipped kitchen, cable television, iPod docking station, BBQ grill, hair dryer, air conditioning in bedrooms, ceiling fans in all rooms. One of the nicest units in the building. Winter: Nov 1-Apr 30, $420 per night; Summer: May 1-Oct 31, $225 per night. LP-74 - Seventh floor ocean front/corner two bedroom penthouse. 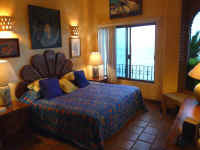 King bed and two twins, two baths, master bath with tub/shower, high ceilings, fully equipped kitchen, cable TV, CD player, VCR, a/c in the bedrooms, ceiling fans, living and dining area opening onto a large wrap around balcony with fabulous views of the entire Banderas bay, Los Muertos beach area and the Sierra Madre mountains. Winter: Oct 1-Apr 30, $460 per night; Spring: May 1-Jun 30, $385 per night; Summer: Jul 1-Sept 30, $290 per night; Holiday weeks, 7 night minimum, please inquire. LP-75 - Seventh floor ocean-side penthouse studio. 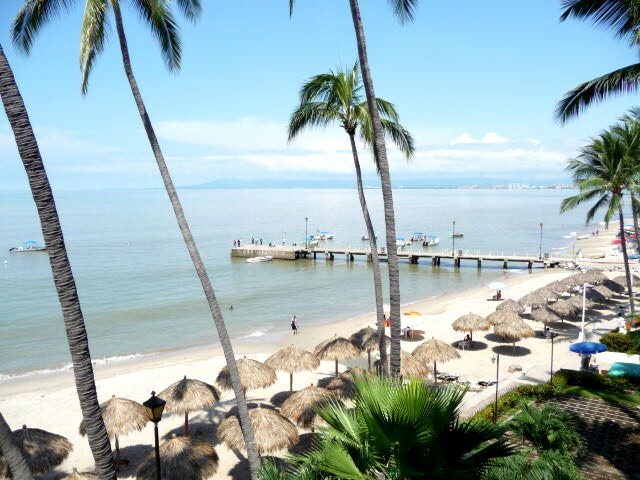 Nicely decorated and comfortable condo with a queen bed, one bathroom, high ceilings, fully equipped kitchen, cable television, CD player, a/c, living area opening onto balcony with a lovely ocean and mountain view looking to the south and west. Winter: Nov 1-Nov 19, Nov 28-Dec 19 and Jan 4-May 31, $144 per night; Summer: Jun 1-Oct 31, $94 per night; Holiday weeks: $166 per night. LP-76 - Seventh floor ocean-side condo. Two bedroom with king beds, two bath, equipped kitchen, living area opening onto balcony with very nice partial Bay and city views looking to south and west. Recently with new face, hand, beach and bath towels, new dishes, two cable TVs, bed spreads, lamps and curtains, wireless internet. Moderately priced. LP-77 - Seventh floor east-side condo. One bedroom with a queen bed, one bath, equipped kitchen with coffee maker, blender, toaster, microwave, breakfast bar, boombox type CD player, cable television, a/c in bedroom, living area and bedroom opening onto balcony with a beautiful mountain and city view (no ocean view) looking to the east. Recently repainted, with new plumbing, TV and boom-box CD player. Winter: Nov 1-Apr 30, $150 per night. Terms of Payment: Condo rentals are payable by cashier check, official bank money order, wire transfer or via Paypal (you can use your own Paypal account or pay by your credit card, plus an additional 3% surcharge needs to be added). To confirm your reservation, the 50% deposit has to arrive within four-six (4-6) days. The final payment is generally due at 35-40 days before arrival, or at 60-65 days before arrival for holidays. Price includes taxes, but does not include your personal tips for maid service and staff. If you reserve at less than 40-50 days before arrival then full payment is due at the time of reservation. Inquiries: For further information or to make a condo reservation, contact via email at michaelmayo72@prodigy.net.mx or telephone Mexico from the United States or Canada: 011-52-322-222-6918. 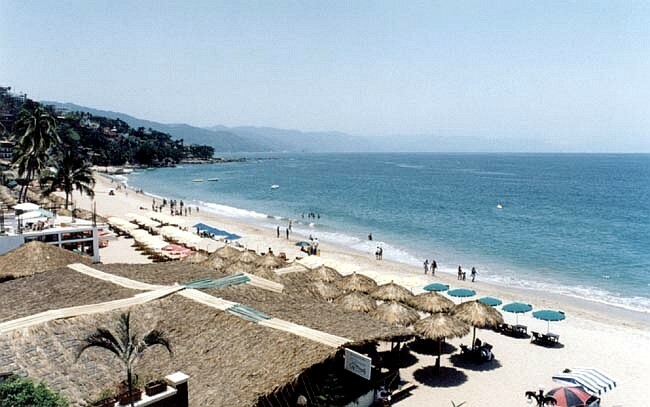 Note: Please refer to the main Puerto Vallarta Condo Rentals page for further important information.